The colourful world of tokidoki has landed at Changi Airport, just in time for the March school holidays! 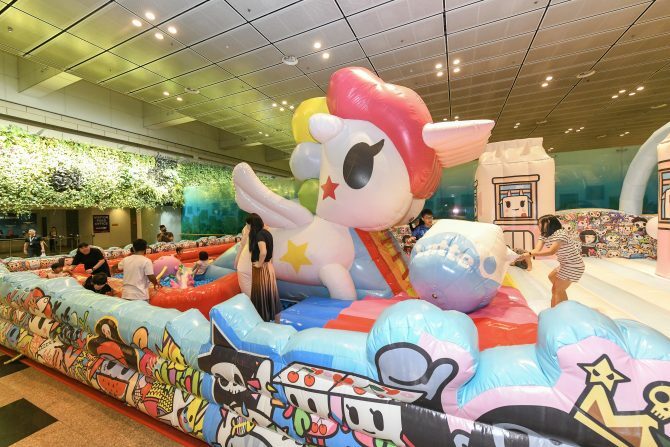 Now until 1 May 2019, Terminal 3 plays host to a huge tokidoki inflatable playground, super Instagrammable tokidoki-themed showrooms, and more activities that fans of the popular lifestyle brand will love. The tokidoki brand is beloved all over the world for its cute characters with a touch of funky punk rock, inspired by Japanese art and pop culture. Singapore is definitely no exception to the mania – we made history by launching the world’s first-ever Tokidoki pop-up cafe in our Lion City a year ago. 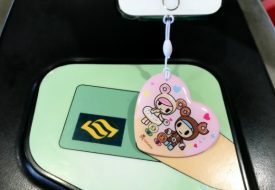 Team Weekender also witnessed the force of the local fanbase when we previewed the tokidoki at Changi Airport event, where children as well as their parents arrived all decked out in matching tokidoki outfits and accessories to show their love for the brand! So if you’re a big tokidoki fan, Changi Airport Terminal 3 is the place to be right now. Step into the T3 Departure Hall, and a big, wildly colourful inflatable playground will catch your eye just opposite check-in row 11. You can’t miss it, and you should not. At 24 metres long, it’s definitely the main attraction of the tokidoki at Changi event, and a dream for fans. 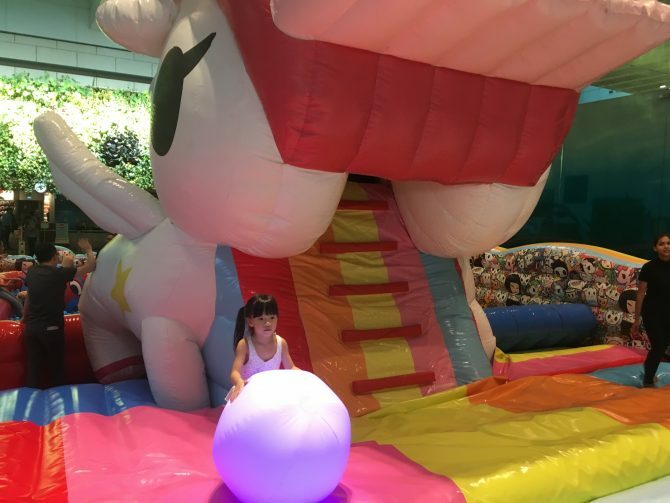 The tokidoki inflatable playground brims with the vibrant life of its adorable characters, placed around the playground in larger-to-life inflatable forms. Having a bouncing good time with your favourite characters, from SANDy and her cactus friends to the milk carton-shaped Moofia, and don’t forget to capture your moments with a photo or two! Your little ones have a fun adventure laid out for them at the various tokidoki-themed obstacles. Think of the glee the kids will feel whooshing down a mini tokidoki dinosaur slide, bouncing mini trampoline “donuts,” and zipping down the world’s largest Unicorno slide! Yup, we’re making tokidoki history again! The five-metre high slide is a great beauty, flanked by the adorable Unicorno. Go down the rainbow-striped slide and plunge into a big ball pit, where more fun with Sea Amo, Romantico, Pirate Puff and Jelly Cat inflatables await. Fellow grown-ups, if your inner child is squealing right now, let it loose! 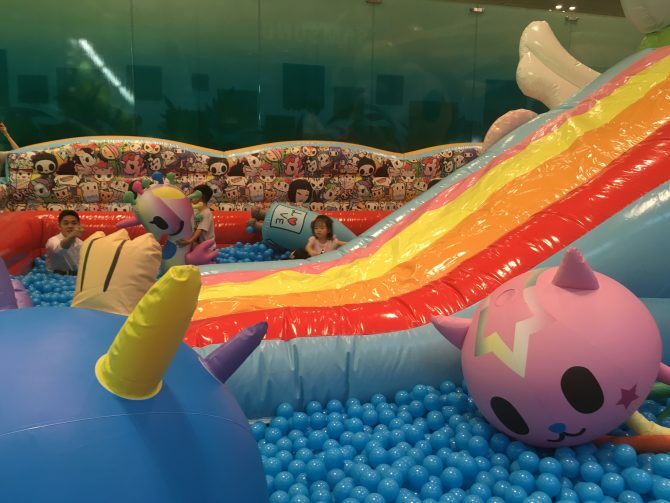 Singapore has seen a fair share of bouncy castles and play areas great for both kids and adults lately, and the tokidoki inflatable playground is no different. Snap your photos, then put down your phones and bounce your heart out with your family, friends and your favourite tokidoki characters! Now until 24 March, the playground will be open from 12pm to 11pm daily. It’s best to take advantage of the March school holidays to visit it, because from 29 March to 1 May, it will only be open from Fridays to Sundays. 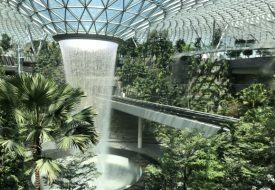 All you need to do to gain access to the playground is to spend a minimum of $60 (or $80 at the supermarket) in no more than two same-day receipts, at any Changi Airport retail or F&B outlet. 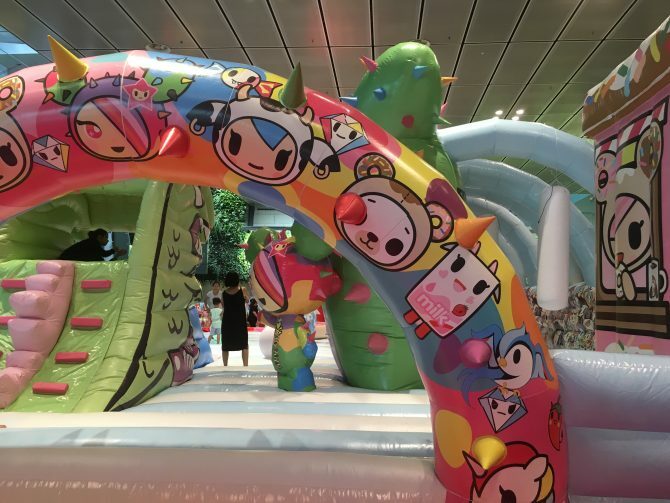 That would grant you one pass to the tokidoki inflatable playground. MasterCard holders who fulfill the aforementioned spending criteria can redeem two passes to the playground. Each pass admits up to two people (either one adult and one child, or two children), for a play slot of 20 minutes. The fun doesn’t stop at the playground! Make your way down to T3 Basement 2, opposite the Kopitiam, where you can indulge your dreams of living in a tokidoki world at home. tokidoki@home, a unique show flat modeled after a 3-room HDB flat, is lined wall to wall, corner to corner, with tokidoki decor and furnishings. 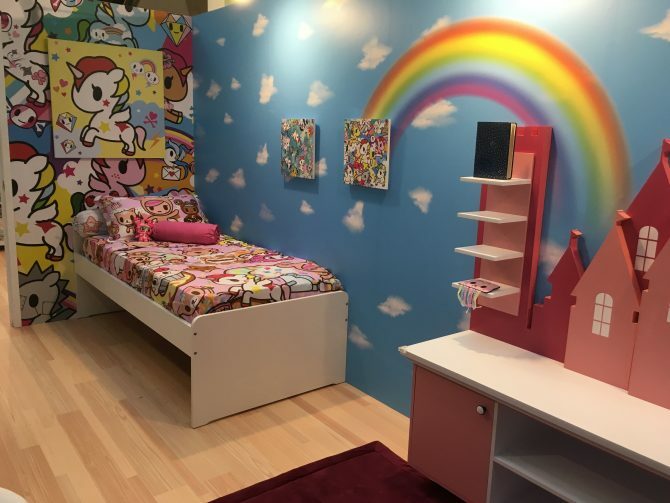 Beds with tokidoki bedsheets and plushies, tokidoki tables, tokidoki pop-art posters and wallpapers… it’s a tokidoki paradise where you can feel right at home! Best things about it is, it’s free to enter for all! Take a tour around the various rooms and snap some selfies with the life-sized tokidoki mascots. Relax on one of the beds and have a little game with your loved ones – just imagine the gorgeous room is your own! And who says the rooms can’t actually be yours? The tokidoki items on display in the show flat are all yours to purchase and turn your own home into that magical tokidoki paradise. Pop by the shop right beside the show flat to find the tokidoki-themed furnishings such as bedsheets, cushion covers and towels. There’s also a wide range of merchandise and collectibles, including matching parent and child shirts and bags. Changi Airport is also giving you the chance to meet fan-favourite tokidoki characters Donutella and SANDy for the first time in Singapore! The mascots will be holding meet-and-greet sessions T3 Basement 2’s new lifestyle event area ST3PS (look out for the wide steps featuring tokidoki characters at each landing), on weekends from now till 24 March, at 2pm and 5pm. The brand’s designer Simone Legno not included, though, unfortunately! Against a unique backdrop of the tokidoki family with a localised Changi spin, you can get a beautiful family photo to share with everyone. 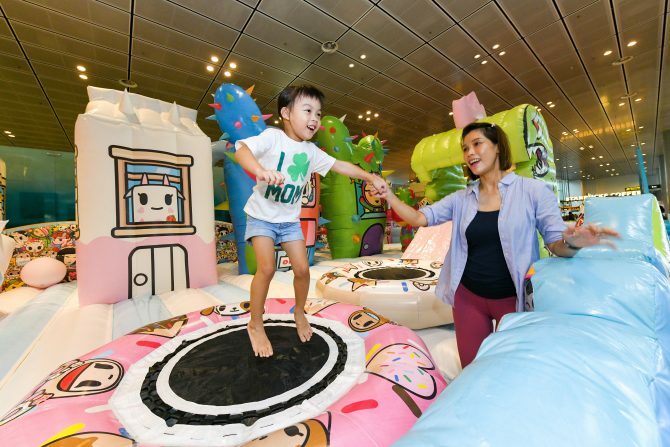 Those who qualify for a pass to the inflatable playground (spend a minimum of $60, or $80 at the supermarket, in no more than two same-day receipts at any Changi Airport outlet) will also get one pass for the meet-and-greet sessions. These passes are given out on a first-come, first-served basis, limited to the first 50 redemptions per session per day. So do redeem yours early right at ST3PS! 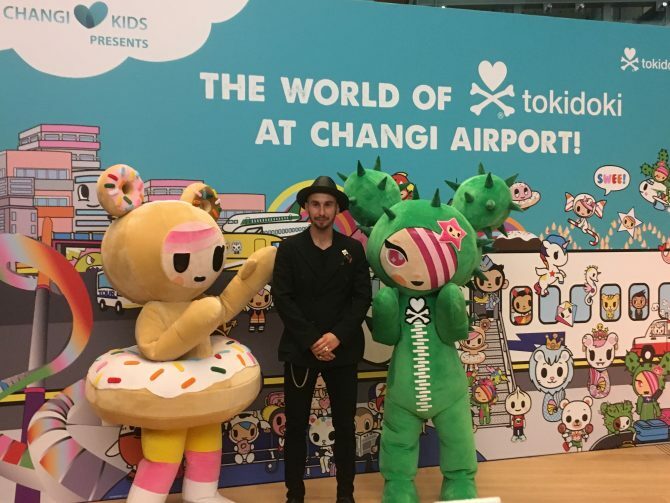 Visit the official tokidoki at Changi Airport event website for more information. 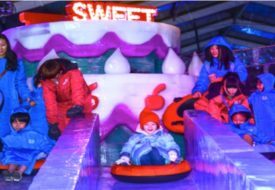 Winter Adventure Park ICE MAGIC Is Coming To Singapore February 2019!